And just that quickly, we have run completely off the rails. 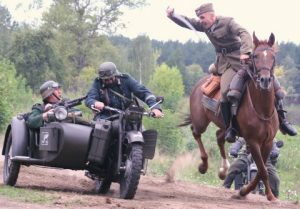 Germany invading Poland in September of 1939 is not a historical hypothesis. It is a historical fact. And Bernier would know that if he knew what a hypothesis is. Such hypotheses are virtually certain not necessarily because there are no conceivable alternatives, but in many (perhaps most) cases because all conceivable alternatives are sufficiently improbable that they can be excluded. Here, by the way, is the crux of the Jesus historicist position — that a historical Jesus fits the evidence better than a mythical Jesus. But we have fundamental mistakes here, which, I admit, are not unique to Bernier. First, they assign probability based on a kind of feeling, which they assume to have weight and validity because they have been studying the subject in depth for a long time. Second, they assume that since H is more likely than any not H hypothesis they can imagine, that the probability of H must approach 1.0. It never occurs to them that the state of the evidence might force us to admit we don’t know. Can I conceive of a world in which all the documentary and eyewitness evidence for Germany’s invasion of Poland in 1939 is falsified and it never took place? Perhaps. Is that alternative probable? Hardly. Nonetheless, in principle, even the most probable statement is subject to revision upon the emergence either of new evidence or new insights into old evidence. Again, and I simply cannot stress this point enough: Hitler’s invasion of Poland is not a hypothesis. It is a fact, amply demonstrated by hundreds, if not thousands of bits of firsthand evidence. We have eyewitness accounts, contemporary radio broadcasts, photographs, motion picture film — untold mountains of physical, tangible evidence. It is beyond question. It is an event. It is a fact. Then what exactly is a hypothesis, and how does it differ from a fact? First of all, we need a historical hypothesis when our evidence is limited. That is to say, we infer from evidence and argumentation in order to establish a likely explanation for something that is open to question or interpretation. If our evidence were complete and unambiguous, we would instead simply have a fact. On the other hand, without facts — buttressed by multiple, independent, verified bits of primary evidence — our hypotheses would stand upon mere conjecture and speculation. For example, A.J.P. Taylor did not deny the fact of the invasion of Poland, but he did offer a new evaluation of Hitler’s motives for doing so. Marxist historians do not deny that Julius Caesar curried favor among the urban poor, but they provide new interpretations about why he did what he did. Second, according to most historians, a good hypothesis should give us the simplest explanation with the most explanatory power. A historical hypothesis should not create more problems than it solves. I suspect Bernier wants to compare Jesus’ existence to the invasion of Poland because he wants us to think both are equally unassailable, and force the conclusion that only a nutter denialist would disagree with either proposition. Whether he knows he’s engaging in sophistry is another matter, which I will set aside at least for the moment. The recent resurgence in arguments for Jesus’ historical non-existence rested entirely upon the argument that there had emerged new insights into old evidence. The reason that these arguments fail is because those competent in the matter and fully familiar with the evidence recognized immediately that these were not new insights at all but almost without exception insights that had been advanced and rejected the better part of a century ago. We have seen this assertion before. There is, they say, no new thing under the sun. And if he were correct, we could almost forgive a PhD who writes about history who so badly misunderstands the historical method. Yet in every case the defenders of historicity have consistently shown that they either cannot or will not engage with the arguments at hand. And this goes back as far as we can look. Consider the terrible job Shirley Jackson Case did in his treatment of Drews. Did he even read any of it? Consider how many times McGrath misrepresented what Earl Doherty wrote. Do we chalk it up to incompetence or malice? They remain unaware of the deep-seated problems in their field. Unfortunately, none of them seem to comprehend the categorical difference between establishing the historicity of Jesus vs. the fair assessment of a particular historical reconstruction of Jesus if he existed. In fact, they are so inept and ill-prepared to address the concept of minimal historicity that they almost invariably fall back on their special knowledge and authority. Trust them. They know. Isn’t that right, Dr. Bernier? There is a reason that one can count on two fingers the number of credentialed New Testament scholars who subscribe to the hypothesis that Jesus never existed: quite simply, competent familiarity with the data precludes affirmation of the hypothesis. Some of us can remember when NT scholars who appealed to this argument would confidently intone that “not a single credentialed NT scholar” doubted the historicity of Jesus. Who knows? Next year we might need as many as three fingers. I think our only hope for improvement here is for real historians to get involved. I see that Bernier has a bachelor’s in anthropology. That’s nice. Unfortunately, his MA and PhD are in religious studies, which I think helps explain his approach to history. If we had fewer ministers and theologians, and more professional ancient historians (driven, we hope, less by confessional interests), perhaps things would improve. Until then, it falls to us amateurs to throw up a flag and hope that at some point people will notice. Be sure to re-read Neil’s post from 2011: “What is history? What is a historical fact?” It still applies. Posted on 2019-01-28 21:40:02 GMT+0000 by Tim Widowfield. This entry was posted in Historiography and tagged Historical Method, Historicity of Jesus. Bookmark the permalink. For what it’s worth, I have a small piece coming out FFRF’s Freethought Today this next month that addresses this a little bit, just the topic of the credibility of the mainstream model. I’m also trying to get a more in-depth piece into CFI’s Free Inquiry magazine, but I haven’t gotten acceptance on that yet. From my perspective I’m doing two things: 1) Moving forward with new scholarship on the basis of the mythicist model, i.e. no longer arguing for mythicism, rather presenting new material within that framework, like presenting new astronomical findings on the assumption of heliocentrism as opposed to arguing for heliocentrism. 2) Calling the mainstream case into question on its own, without framing the issue as one of mythicism. In other words, there are serious problem with the mainstream model that need to be addressed, even if one doesn’t assume mythicism is the solution to those problems. I also think it’s important to acknowledge the “bad scholarship” among mythicists. We can’t act like everything is reasonable. Yes, there are some nonsensical claims made by some people who claim that Jesus never existed. But you know what, there are also many nonsensical claims made by people who think that Jesus was real too, and we need to make that clear. Mythicism definitely has a problem with “poisoning the well.” Yes, there are some crackpots in the field, that’s true, but is claiming that Jesus worship developed from the worship of Egyptian sun gods really any more crazy than people claiming that the Gospels are eyewitness accounts and that the resurrection and all the miracles are confirmed facts? Because guess what, people with PhD’s from seminary schools, some of the prestigious, make such claims. Yes, I agree. There are deep problems in the world of mythicism. For example, I stayed away from the astrotheology foolishness not just because it isn’t worth talking about, but also because Murdock’s fanboys are an extremely unpleasant bunch. One of the biggest problems I see over and over again is the mistake of thinking that just because you’ve apparently made the pieces fit, you’ve solved the puzzle. That’s where we get into issues of simplicity, plausibility and explanatory power. I about done with argumentation. I demand EVIDENCE; testable, verifiable evidence. I’m tired of people blowing smoke rings and expecting other people to jump through the hoops. Without solid evidence, what the hell are we arguing? This would seem to demand what we haven’t got and probably never will have. We have no corroborating evidence for Christianity’s origins outside the New Testament contemporary with it’s authors. You are I hope speaking in jest, pointing out an impossibly high standard that those setting such do not for for one moment adhere to themselves; but if so you should make that clear. Tim, It seems to me that Carrier is correct in calling for formalization once the probabilistic nature of knowledge is acknowledged, hence Bayesian formalism. For some reason that escapes to me, you avoid it when it would have been only natural to apply it related Hitler’s invasion vs. Jesus historicism. In that case you can clearly argue why you can treat HI as background information with a probability near (but not quite) 1 thanks to all the evidence you mention, as opposed to JH. So the question I have, is your reluctance to employ Bayesian formalism meditated? Thanks. In general I have no issues with Bayesian statistics and recognize its utility in forensics and history. However, in this case, I think biblical scholars need to crawl before they can walk. They don’t appear to realize how much they don’t know and how much they’re just winging it. Beyond that, you simply don’t need math to prove a fact. The invasion of Poland is an established fact. (Hell, there are people alive today who lived through it.) The existence of Jesus is not. Bernier is comparing two different categories as if they were the same thing. It is not a question of degree but of essence. – The moment you talk probability you’re talking math. Bernier and McGrath are agreeing to that, you should use it. – “you simply don’t need math to prove a fact.” Well, what is a fact for you is clearly not a fact for JH people, and vice versa. However, the premise of probability is accepted by both, that should allow to guide the discussion (assuming honesty on all sides, not a given, I know). – “They don’t appear to realize how much they don’t know and how much they’re just winging it.” Well, that’s the point, you need to show how much they don’t know, so you need to quantify. Even if you don’t use numbers, you can point why the probabilities are high in one case (and can be considered fact) and low on the other. You started doing it but move away from it. Keep in mind that not all cases will be clear cut as in the Hitler’s invasion and that there is a gradation on certainty which directly depends on the amount and quality of evidence. Myself, and I think many other people, are underwhelmed, if not put off by, Carrier’s use of probabilities. They don’t really seem grounded in anything and just kind of detract from the whole issue IMO. I’d say that’s one of the things about Carrier’s work that i like least. It becomes a distraction. Not to mention it’s a misapplication of the Theorem at the outset. In case you haven’t been informed yet, your web-site certificate just expired. This post reminds me of some of the discussions I have followed on various forums where proponents of an Historical Jesus simply proclaim that their hypothesis is as obviously true as any observable fact about the world. Anyone who questions the ‘fact’ of an Historical Jesus is comparable to a Creationist, a Holocaust denier, or a Flat Earther. They seem to think they are lifting up their hypothesis to the level of confidence and reliability of the theory of evolution, 20th century history, or physics when it is apparent to me they are simply trivializing them by equating the mountains of physical evidence on which they are built to the molehill of dubious texts which can possibly be interpreted to support the Historical Jesus. Well if course the Nazi invasion of Poland in 1939 isn’t a hypothesis. It’s a theory as any believer can tell you. Think of how much things would improve if ministers and theologians without confessional interests examined the hypothses from the standpoint of intellectual honesty. 1+1=2 Such is obvious. The proof that it is so runs I am told to fifty pages. A fact is both a tested hypothesis and a proven theory. That is what I understand makes it a fact. That I derive from reading your post, Tim. On then reading the whole excerpt in McGrath’s post I think that is what is probably meant from what follows in the paragraph. That the Wehrmacht did indeed invade Poland is a tested hypothesis and a proven theory and so a fact. The theory formulation and hypothesis testing is done more or less instantaneously in our minds on seeing the evidence rather than being set down on paper. We assume the formalities have been undertaken elsewhere. Bernier makes a similar assumption that an historical Jesus, and only an historical Jesus, is necessary to account for the origins of Christianity. He looks back a century and finds that scholars have inded found so. He probably neglects however to check whether previous scholars have worked the problem in sufficient depth or at all. Reading the whole post on Bernier’s site, he makes a whole series of specific claims that seem to suffer from similar problems of bogus reasoning; nevermind going beyond the resolution of the tools he is using! You illustrate your article with a photograph captioned “The Polish Cavalry at the Battle of Mokra, 1939”. Such did actually happen but illustrating it with a still probably from a film, television programme, or other re-enactment doesn’t prove it! (This is something I’ve looked into before, I recognise the still from doing so, though not the specifics.) A malapropism that illuminates your argument with rather appropriate humour, if accidentally. We have no original biblical manuscripts. Teachings of Catholicism, and even Orthodoxy, change in response to the ongoing nature of human knowledge. History contains no instructions for getting behind the curtain to naked reality itself. perhaps makes it too clear he is talking balls. A salient point to make about Berniers’s argument is the illegitimate juxtaposition of an argument from modern history that is slam-dunk with an argument that is anything but from ancient history. In modern history we can attain much greater granularity and resolution than we can from ancient history and the probability that the argument is settled is orders of magnitude greater; though still not approaching 100%. All that needs saying other than that is that Bernier is mistaken in thinking the problem has been worked in sufficient depth or in most cases at all; and in being mistaken and neglecting that, apart from mythicists arguing Jesus’ none existence, they are asking that question (Has the problem has been worked in sufficient depth or at all?) and answering in the negative having investigated. Then leaving Bernier, Mcgrath, and Wiggins to shoot themselves from reading their articles ourselves. This would save working in our own misunderstandings making their errors fallaciously greater than they are already. They are only going to be liable to make such accidents out to be deliberate and use them for further dismissal. Good post all the same.